Team Tronics is participating as community members in the TRON Super Representative election. We pledge to follow the key aspects of accountability, trustworthiness, honesty, and openness to every person who has invested time, money, and faith into this project. We believe in the immense importance of the TRON project. As team members we feel that if you are working on a project that you truly believe in, you will never see obstacles, only solutions and the vision that we are all aiming for will pull us to where we need to be. The details below explain further the Education Program released in our Community support plan on the 24th April 2018. Team Tronics thanks the community for their incredible support and would like to present our Education program. First and foremost, we believe that for any program to be effective the community must feel it has a voice. If elected it’s our mission to build and maintain a platform that gives all members an equal voice. Every member of the Tronics community will have the ability to suggest, vote, and participate in Tronics supported projects. TRON has developed one of the industry’s leading blockchain environments, and with that we feel it is our responsibility to build an ecosystem alongside this environment that facilitates a fluidity to its users greater than what has been seen before. It is our goal to become a liaison between the core technology within TRON’s network and community driven efforts to expand on this technology helping both Tron and its technology flourish. Team Tronics University will stride to engage the community members, focusing on the knowledge about TRON, their partners and everything blockchain. We at Team Tronics understand that every member who registers with us will have a certain level of understanding of TRON, Crypto, Blockchain related. There will be members who are just entering the space, others who have been around for years and we want to offer learning experiences that are tailored for increased engagement and achievement; from novice to expert. These activities and experiences will range from reading articles, taking quizzes, test and watching videos. We will be running full courses and degrees allowing members to monitor the progress of their studies. Why would members of the community want to be a part of the University? To us, the answer is simple, we want to strengthen and build the skills of the Tron communities, and we put special importance on knowledge. The next time you are speaking with someone who may ask about or even someone who is spreading FUD about TRON or blockchain in general; you will be armed with all the information to have a discussion/debate with them and help them to understand why you feel the importance of TRON is so great to the world. Team Tronics, if voted to represent the community as a Super Representative; will pledge to allocate annual rewards to the community as detailed in the Community Support Plan. ‘Team Tronics’ is community built and driven, and all members should feel comfortable in communicating with us, regardless of how trivial or concerning, the Team will do whatever it can to help. The university is utilising an existing online platform for its initial release, this gives us the greatest flexibility while we understand how we can format our own original platform, to give the best online learning environment the TRON community deserves. Community members will be able to register to gain access to the challenges, course’s and quizzes. Rewards can be earned by completing these classes and reading articles about Tron, its partners and Blockchain as a whole. The token reward amount will be dictated by the complexity of the quiz, challenge or course. Community members will work through one class at a time, you will not be able to progress to the next class until you have successfully passed the previous class. All members will start from the beginning allowing for a unified advancement of all the material. There is no restrictions as to how fast you can progress through the classes, but new content will be added at defined times. By using these rewards, as well as providing good content we hope to improve long-term participation rates and help build the strongest community possible. The material will be deemed crucial in the understanding and application of creating and expanding upon blockchain technology in general. The content included in the University will be made up from all aspect of ‘TRON’ and blockchain, and the TRON Foundation will have a direct level of input to this content. Upon completion of these classes, rewards will be allocated. Team Tronics will pay their rewards in TRX, this is the safest option for community members. TRX at this time is the only Coin with value and a real usability. We don’t want to expose the community to uncertainties around issuing a unknown token that has no use on the wider TRON platform, and is ultimately controlled by the issuer. Team Tronics Voters and Non Voters. Because we believe in an inclusive community and education available to all TRON and crypto holders, we will not limit who can access our educational material, but to show our gratitude to those in the community who do vote for us, we will increase their rewards compared to a non voter. Challenges and quizzes are a single class with multiple questions, Courses are made up of several Challenges and/or quizzes and will be awarded a bonus upon completion. To be able to offer the best rewards possible we need to understand what the teams projected SR rewards will be, so we will be annoucing the specific reward amounts for each challenge, course and quiz for voters and non voters on or around the 15th July. This will give us the time we need to make the rewards the best we can possibly offer. All content and material will be created by this great accumulation of knowledge, allowing us to provide the most diverse and inclusive classes that can be offered. We will have exclusive content created solely for the university giving us the greatest control over how we present the classes to the community. 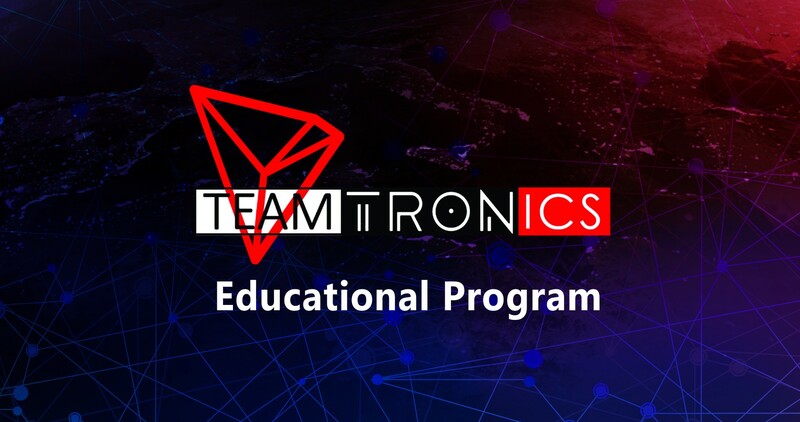 Team Tronics will strive to make education truly decentralised, content will be provided by the experts in our world wide community, assistance will be available from a decentralised pool of people who believe in the vision of TRON. We thank the community for taking their time to read our proposed Education plan, and are humbled at the prospect of the opportunity of being elected to Super Representative on the communities behalf. A community driven movement, to decentralize the web.